Understanding star and planet formation is one of the major goal in modern astrophysics and must now be tackled using a multidisciplinary approach. Here we propose to combine star formation numerical simulations of cloud collapse with microphysical evolution gas and dust models to understand how material from the Interstellar Medium (ISM) is delivered into a protoplanetary disc, such as the solar nebula. Confrontations to meteoritic and specraft data thanks to the coupling of ISM simulations with solar nebula disc models will trigger important progress for our knowledge of the coupling between ISM and planet formation. 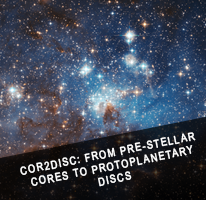 The main goals of cor2disk is to produce self-consistently protoplanetary discs from the collapse and to follow its evolution. As stressed in the original proposal, this is challenging when non-ideal magneto-hydrodynamics (mhd) is included because the timesteps induced by the second derivatives are very small, making integration over long timescales a difficult issue. On the other hand, we found it to be really necessary in order to get reliable results since it really has a strong impact onto disc formation. During the last months, we have conducted a series of numerical simulations, with various numerical resolutions, that we are now using to conduct detailed analysis of the disk formation and evolution. Our work this year developed on two aspects: (1) MHD simulations of prestellar core collapse, in order to characterize the flux and the disk formation, with different initial conditions (varying the rotation, turbulence and magnetisation) as well as the numerical resolution (by a factor up to 4) and (2) 1d simulation of gas and dust transport in a disk fed by a molecular cloud. One of the main difficulties of the problem here is that ideally the disks need to be followed over hundred of thousands of years while the timesteps in the disk can be as small as few hours. Such small timesteps are a consequence of the high resolution (sub-AU) and the presence of non-ideal MHD (which entails second order spatial derivatives with Courant conditions proportional to dx2). Therefore we have developed an original methodology that to our knowledge has never been applied in this field. We follow the disk evolution at the maximum resolution we can afford given the time scale we want to cover (typically at 1 AU we can calculate for about 100,000 yr). Then at different epochs we restart the simulation at higher resolution up to 0.25 AU. These high resolution simulations are calculated only during a short period of physical time until the statistics are stationary. We believe that this method can be applied because the disk size is largely controlled by the external magnetic field. From these high resolution calculations we can get more accurately the values of the transport coefficients. Figure 1 Three time steps of the low resolution calculation. The integration is performed over 50,000 yr. Zoom over the very inner part of the calculation (8 AMR levels are used), the simulation box size is about 0.1 pc. Figure 2 High resolution calculations restarting from an advanced timesteps of Fig 1. Left panel: 0.5 AU of resolution, right panel 0.25 AU. Concentric rings that are not present at low resolution appear. They present strong similarities with the work of Béthune et al. (A&A, 2017) who proposed that they may be due to the magnetic field large scale self-organisation. They constitute a possible interpretation of the striking rings observed in the disk HL-tau. This is illustrated in Fig. 1 and Fig. 2 where a timeseries of the low resolution calculation is displayed. The disk evolution is followed over more than 50,000 yr which at this resolution is to our knowledge the only calculation so far. Figure 2 portrays high resolution simulations restarting from the calculation displayed in Fig. 1 but with 0.5 and 0.25 AU respectively. Striking rings that were not present in the low resolution calculation develop. They are reminiscent of the rings observed by Béthune et al. (2017) which may be a possible interpretation for the prominent ans spectacular rings observed in the protoplanetary disk HL-tau. In the view of measuring the relevant parameters to then perform 1D calculations over long time scales, we have obtained the source function as described in Hueso & Guillot (2006). It is obtained by integrating the mass flux on the disk surface. The result is portrayed in Fig. 3. It shows that it is relatively flat with an excess at small radii (which is more pronounced in higher resolution runs, not shown here for conciseness). We are presently extending this result by considering other initial conditions and later timesteps. Figure 4 Profil of α (Maxwell, Reynolds and gravitational). Left: low reso-lution (1 AU). Right: high resolution (0.25 AU). We have also calculated the a values which characterise the transport of angular momentum within the disk. The three contributions namely, magnetic, turbulent and gravitational are displayed in Fig. 4 at low resolution (left panel) and high resolution (right panel). Typical values running from 0.01 to 0.1 are obtained above 10 AU, while in the very inner part (< 10 AU), the values seem to be very small (but resolution may be a problem). Finally, in order to quantify the transport properties within the disk, which is not necessarily equal to the alpha coefficient, we have introduced a passive scalar within the disk at some specific timestep and we have followed them through time. This is displayed in Fig. 4. It is seen that the passive scalars spread as time goes on and we are currently using them to quantify the transport coefficient. In parallel to the simulations, we study the transport in a gaseous disk fed by a molecular cloud, we wrote a 1D code, using the Alpha Sakura Sunyaev prescription, including both gas and dust transport. The collapse of the molecular cloud is described, for the moment, using the simple model of Hueso & Guillot (2006) that compute the mass loading of the disk, due to cloud collapse, assuming a conservation of angular momentum, and constant accretion rate onto the disk. The molecular cloud is assumed to be made of a gas with solar composition. We explicitly track in the system the evolution of the spatial distributions of both very refractory species (silicon carbides, CAIs) as well as volatile species (water, sulphides, and CO components). For this first year of the project, and in order to prepare in good conditions the arrival of our PostDoc working in the Core2disk project, we wished to answer the following questions: (1) where are the refractory species formed in the disk during the cloud collapse and where are they transported and (2) how water is distributed at large scale in the disk, and how its local concentration evolves with time. The first version of the code is almost finished (that is a version with a very simple description of the cloud collapse) and a paper is under redaction. In 2018 we have published a paper, in collaboration with F. Pignatale and M. Chaussidon and E. Jacquet where we computed the dust transport and evolution in a disk fed by the molecular cloud, but using a simple description of the nebula infall, the Shu (1979) self-similar solutions. The paper has been accepted in October 2018 as an APJ Letter. The main results of our accepted paper is that the nebula infall (1) allows to transport CAIs at large distances and (2) allow to create a zoning of material that may explain the origin of the different chondrites families (water poor enstatite, CAI rich carbonaceous chondrites) and that show that pristine ISM material can be stored in the Solar Nebula. (see Figure 5). This published work shows that our approach starts to produce results and now we need to do a tight coupling with MHD RAMSES simulations. In addition, our results cast a new light on the origin of solids by showing that the dynamics of the infall play in the key role in the radial distribution of solids. However, in Pignatale et al. (2018) a simple self-similar cloud collapse solution, that ignores magnetic field was used. So in the next year we need to redo this work with the gas source function derived from MHD simulations.